It seems that everything we talk about on Coasmos4Kids is coming together at one point or another. Stars are made of gas and dust that come together. Planets are bits of small rocks and asteroids that come together. Even galaxies are made of stars and systems that come together. Stars are constantly moving through the universe just like everything else. As they move, their gravity affects the neighbor stars. Slowly they came together (billions of years ago) and formed galaxies. Galaxies aren't just a few hundred or a thousand stars working together. Some are made up of tens of millions of stars and systems. It is amazing that with all of these pieces, they only tend to form a few shapes. As galaxies spin, they form either spiral or elliptical shapes. 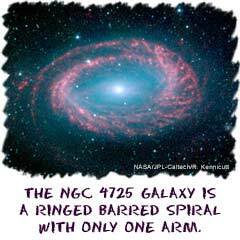 Astronomers think that the elliptical galaxies are older than the spiral ones. There are also variations of each type. The Milky Way is currently thought to be a barred-spiral galaxy. That means we have a densely packed stellar bar in the middle of our spiral.